Chronic inflammatory disease affects millions of individuals around the world. Inflammation occurs when foreign bacteria bind to receptors on cell surfaces, thereby inducing macrophage activation. This series of actions leads to the release of pro-inflammatory molecules, like nitric oxide (NO), resulting in inflammation. A major driver of inflammatory responses is the transcription factor nuclear factor kappa-light-chain-enhancer of activated B cells (NF-kB). This study seeks to examine the interaction between OA-NO2 and transcription factor NF-kB to understand the immunoregulatory properties of nitro-alkene derivatives such as nitro-oleic acid (OA-NO2), a common electrophile present in low concentrations within human blood and capable of participating in Michael addition reactions with distinct nucleophilic amino acid residues on the surfaces of proteins. Using RAW 264.7 murine macrophages, monocyte differentiation into macrophage subsets was examined with immunoblotting and spectrophotometry assays to understand the signaling pathways behind these interactions. Results revealed that although bacterial liposaccharide (LPS), an inducer of NF-kB, did increase expression of nitric-oxide synthase (iNOS) and upregulated NO production, OA-NO2 failed to inhibit the effects of LPS. To improve upon these preliminary findings, the sample size of the study should be increased and IL-4, a potential inducer of “alternatively activated” macrophage differentiation, should be used alongside LPS to further analyze the effects of OA-NO2 as an immunomodulatory agent. This data could prove instrumental in reducing chronic symptoms of inflammatory illness worldwide. Chronic inflammatory disease can occur as the result of various factors ranging from foreign bacterial bodies to the uncontrolled replication of cells within organs [1, 10]. Regardless, each of these factors results in inflammation, which could progress to fibrosis if unchecked, producing densely scarred tissue that overlays an organ’s original structural architecture [1, 10]. In the lung, fibrosis is characterized by irregular and excessive tissue growth in the alveolar sacs, ultimately causing lung failure and eventually, death [1,10]. Fibrotic responses because of tissue injury originate from excessive macrophage activity inducible by pro-inflammatory agents, such as bacterial liposaccharide (LPS) from gram-negative bacteria, and cytokines like interleukin-4 (IL-4) . Macrophages are phagocytic cells of the innate immune system that differentiate from monocytes into two general subsets, dependent on stimulus, in part based on secreted molecules of activated CD4+ T-helper 1 (Th1) lymphocytes or CD4+ Th2 lymphocytes . Primarily, pro-inflammatory (M1) macrophages can be “classically activated” by bacterial liposaccharide, resulting in a population with the purpose of microbicide, releasing pro-inflammatory cytokines and molecules, such as reactive nitrogen species like NO [1,4]. Anti-inflammatory (M2) macrophages, dubbed “alternatively activated,” are the result of cytokines from the CD4+ Th2 response, like IL-4 [4,10]. M2 macrophages are responsible for tissue healing and rehabilitation, but can simultaneously upregulate fibrotic growth if an excessive immune response is generated [10,11]. Being so, macrophagic regulation is imperative in tissue homeostasis and reducing collagen and tissue growth . This study focuses on understanding how endogenously and synthetically made compounds, like fatty acid nitro-alkene derivatives, influence macrophage activation and polarization. Fatty acid-nitro alkene derivatives (FA-NO2) are endogenously generated through an unsaturated fatty acid reaction with nitrogen dioxide produced by NO inflammatory actions and are thought to play a mediatory role in tissue inflammation . Positional isomers of linoleic acid and oleic acid derivatives are found in human blood in concentrations of less than 1 µM, abundant comparatively to similar species . Nitro-oleic acid (OA-NO2) is currently the most understood of the FA-NO2 species and could potentially be used pharmacologically in macrophagic regulation . OA-NO2, among other FA-NO2 species, is an electrophile that participates in a Michael addition reaction in altering amino acid residues on nucleophilic protein surfaces, preventing protein transcription [2,3]. One such protein complex, nuclear factor kappa-light-chain-enhancer of activated B cells (NF-kB), is a transcription factor responsible for activating inducible nitric oxide synthase (iNOS) and arginase-1 proteins (Arg-1), identifiers of M1 and M2 differentiation . Specifically, when LPS binds to toll-ligand receptor-4 (TLR-4) on the cellular surface, it triggers the translocation of NF-kB to the nucleus, where it can activate the transcription of iNOS and communicate with macrophages to release nitric oxide to combat foreign bacterial bodies [9,12]. Macroscopically, this appears as inflammation. Similarly, IL-4 induces the expression of Arg-1 to preserve a cellular M1/M2 balance . To prevent the resulting inflammation from the proliferation of the macrophages, OA-NO2 is thought to alkylate Cysteine-38 on NF-kB via the Michael addition reaction to prevent its entry into the nucleus, leading to a reduction in M1 and iNOS expression [2, 7]. In this study, the activation of NF-?B is assessed through a secreted embryonic alkaline phosphatase (SEAP) reporter stably transfected in RAW 264.7 murine macrophages to determine the effectiveness of varying doses of OA-NO2 . iNOS and Arg-1 expression is also assessed via immunoblotting along with nitrite presence via a Griess assay. RAW 264.7 murine macrophages integrated with the SEAP reporter gene were grown in sterile Dulbecco's Modified Eagle's medium (DMEM) with 10% heat-shocked fetal bovine serum (FBS), 1% penicillin/streptomycin (P/S), and 1% L-glutamine. To account for cell viability, a hemocytometer was used to ensure a live cell count of 550,000 cells/ml of solution. The plated cells were grown overnight to maximize confluency for treatment with OA-NO2 the following day. 9,10 mixed positional isomer OA-NO2 was stored at a 500 mM concentration in a -80°C freezer. Prior to cell treatment, the OA-NO2 was diluted down to a 200 ?M initial stock concentration and to treatment concentrations of 5.0 ?M, 1.0 ?M, and 0.5 ?M, all in sterile DMEM. 100 ?g/ml of LPS was diluted down to a 20 ?M concentration in sterile DMEM. Both the OA-NO2 and LPS solutions were added in volumes of 25 ?l to their respective wells. The treated cells were left to incubate overnight. The rate of SEAP production as induced by NF-kB was measured by a kinetic SEAP reporter assay using a spectrophotometer. Supernatant from the treated cells was collected and SEAP production was detected over a period of 45 minutes at 655 nm using the QUANTI-Blue™ detection medium. Cells from the treated well-plate were lysed and saved in the -80°C freezer for immunoblotting. Protein was diluted 1:10, quantified using a Pierce BCA protein assay, and then assessed to ensure equal protein loading across all wells (Figure 3). All protein suspensions were run alongside 8 ?l of SeeBlue™ pre-stained protein standard in a Novex™ 4-12% Tris-Glycine Gel. Gels were transferred to membranes via transfer cassette overnight. Membranes were blocked in 5% milk solution. To assess iNOS expression, primary anti-iNOS antibody [K13-A] (ab136918) (Abcam, Cambridge, MA) and secondary Goat Anti-Rabbit IgG ([H + L)-HRP (Conjugate #1706515)] (Bio-Rad, USA) were used. To assess Arg-1 expression, primary Arginase 1/ARG1/liver Arginase Antibody (NB100-59740) (Novus Biologicals, USA) and secondary Donkey Anti-Goat IgG(H+L), (Rat/Mouse SP ads-HRP) (SouthernBiotech, USA) were used. Protein expression was quantified by scanning densitometry using the ImageJ™ program. Band densities are reported by density ratio. Nitrite concentrations in cell lysate supernatants were analyzed using a spectrophometric Greiss assay at 540 nm. Nitrite production is the direct result of NO metabolism. T-tests assuming equal variances were used for statistical analysis, as shown in the significance tables. A p-value of less than 0.05 was considered significant. Cells not induced with LPS had minimal rates of secretion in comparison to those samples induced with LPS (20 ?M) after 20 hours of incubation in treatment. However, OA-NO2 showed no effect in reducing the rate of SEAP secretion, and the activation of the NF-kB complex, after cell stimulation. There was no statistically significant difference between cells induced solely with LPS and between cells induced with LPS and OA-NO2. Samples not induced with LPS all secreted nitrite concentrations of less than 5?M whereas samples induced with LPS secreted nitrite concentrations significantly greater than this amount. However, OA-NO2 had no significant effect in reducing nitrite concentrations across all samples, including those induced with LPS. This effect stayed consistent among the varying doses in all treated samples. Across all samples not induced with LPS, iNOS was not expressed as strongly as in those samples induced with LPS. In all samples induced with LPS, banding appears denser. 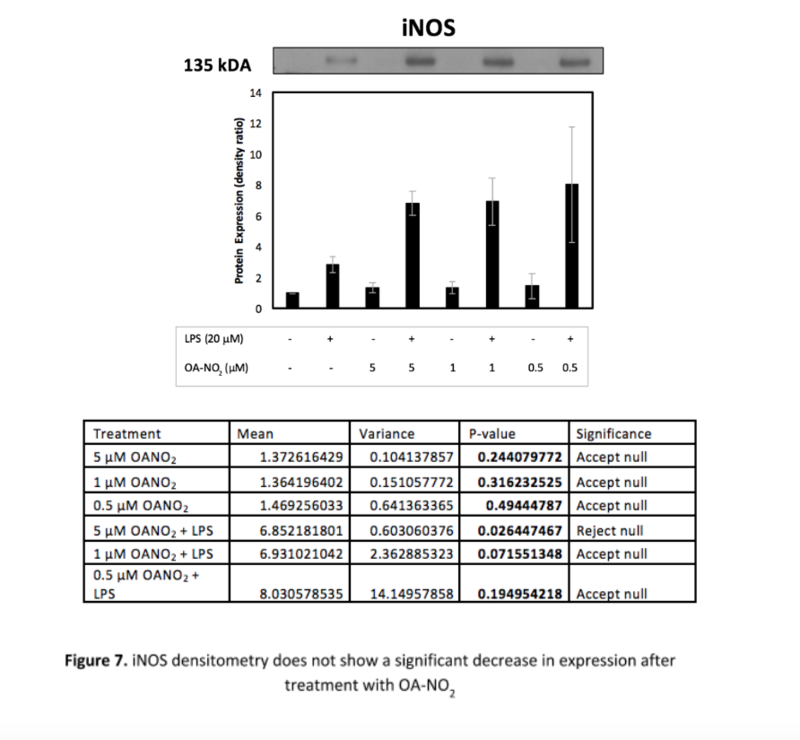 However, OA-NO2 had no effect in lowering iNOS expression among all samples of varying doses. In all cells treated with and without LPS, Arg-1 was expressed in similar ratios. The molecular weight at which banding appears for Arg-1 is ~40 kDa, with banding on this membrane appearing at approximately ~49 kDa. Neither LPS nor OA-NO2 had any significant effect on Arg-1 expression. Although the results from this study do not provide conclusive evidence for OA-NO2 as an inflammatory mediator, they further confirm NF-?B induction of iNOS and Arg-1 by LPS. LPS significantly upregulated the rate of SEAP production within the cell, reinforcing the premise that LPS binding to TLR-4 results in the activation of NF-?B. Similarly, LPS results in the production of NO and in the expression of iNOS, characterizing the role of NF-?B as a transcription factor and the differentiation of monocytes into “classically activated” macrophages (Figure 9). Conversely, LPS did not affect the expression of Arg-1 within RAW 264.7 macrophages after 20 hours of treatment, revealing that LPS does not induce the “alternatively activated” phenotype in RAW 264.7 macrophages. The preliminary data produced by the SEAP reporter assay, the Griess assay, and immunoblotting is not significant enough to conclude that OA-NO2 reduces pro-inflammatory macrophage activity. To improve the efficacy and expand on the findings of this study, samples should be treated with IL-4 to test the “alternative activation” of macrophages. Cells treated with IL-4 may display increased Arg-1 protein expression relative to those without, demonstrating differentiation of monocytes into M2 macrophages. To reduce standard error among each of the figures, further studies should increase the sample size relative to this study. Cell viability should be tested more directly and compared to preliminary results to ensure minimal cell mortality. While the preliminary findings do not provide distinctive evidence of the immunomodulatory properties of nitrated fatty acids such as OA-NO2 in inflamed tissue, the data does provide further evidence for the signaling pathway involved in the differentiation of monocytes into M1 macrophages. Further studies should investigate M2 differentiation as related to electrophilic nitro-alkene derivatives. Ultimately, understanding the involvement of these pathways in chronic inflammatory and fibrotic illness is imperative in reducing disease burden in those afflicted with these conditions. I would like to thank Dr. Andrew J. Gow and Melissa Wilkinson for their insight on experimental procedure and in understanding the mechanical principles behind the research. I would like to express my deepest gratitude to the Liberty Science Center for supporting me in my endeavors this summer and to Rutgers University for hosting me as a researcher. Thank you to James Gow, Alexa Murray, Dr. Changjiang Guo, and Dr. Elena Abramova for assisting me with experimental procedures during my time in the lab. Lastly, I would like to thank my parents for supporting me in my interests and pushing me to succeed. Ambrozova, G. et al. Nitro-oleic acid modulates classical and regulatory activation of macrophages and their involvement in pro-fibrotic responses. Free Radical Biology and Medicine 90, 252–260 (2015). Baker, L. M. S. et al. Nitro-fatty Acid Reaction with Glutathione and Cysteine. Journal of Biological Chemistry 282, 31085–31093 (2007). Batthyany, C. et al. Reversible Post-Translational Modification of Proteins by Nitrated Fatty Acids in Vivo. Journal of Biological Chemistry 281, 20450–20463 (2006). Cassetta, L., Cassol, E. & Poli, G. Macrophage Polarization in Health and Disease. The Scientific World JOURNAL 11, 2391–2402 (2011). Cui, T. et al. Nitrated Fatty Acids: Endogenous Anti-inflammatory Signaling Mediators. Journal of Biological Chemistry 281, 35686–35698 (2006). Klinke, A. et al. Protective Effects of 10-nitro-oleic Acid in a Hypoxia-Induced Murine Model of Pulmonary Hypertension. American Journal of Respiratory Cell and Molecular Biology 51, 155–162 (2014). Perkins, N. D. Cysteine 38 Holds the Key to NF-?B Activation. Molecular Cell 45, 1–3 (2012). Villacorta, L. et al. Electrophilic nitro-fatty acids inhibit vascular inflammation by disrupting LPS-dependent TLR4 signalling in lipid rafts. Cardiovascular Research 98, 116–124 (2013). Wan, F. & Lenardo, M. J. The Nuclear Signaling of NF-?B: Current Knowledge, New Insights and Future Perspectives. Cell Research 20, 24–33 (2009). Wick, G. et al. The Immunology of Fibrosis. The Annual Review of Immunology 31, 107–135 (2013). Yang, Z. & Ming, X.-F. Functions of Arginase Isoforms in Macrophage Inflammatory Responses: Impact on Cardiovascular Diseases and Metabolic Disorders. Frontiers in Immunology 5, (2014). Zuliani-Alvarez, L., Piccinini, A. & Midwood, K. Screening for Novel Endogenous Inflammatory Stimuli Using the Secreted Embryonic Alkaline Phosphatase NF-?B Reporter Assay. Bio-Protocol 7, (2017).